Today we discovered a new walking path on the banks of the Loire opposite Chaumont. It was a crisp six degrees Celsius and very pleasant. Aujourd’hui nous avons découvert un nouveau sentier sur les bords de la Loire en face de Chaumont. Il faisait six degrés et la promenade était très agréable. Posted in: Châteaux de la Loire, Chaumont, Loire River. I’ve developed a heel spur which is literally putting a cramp in my walking. 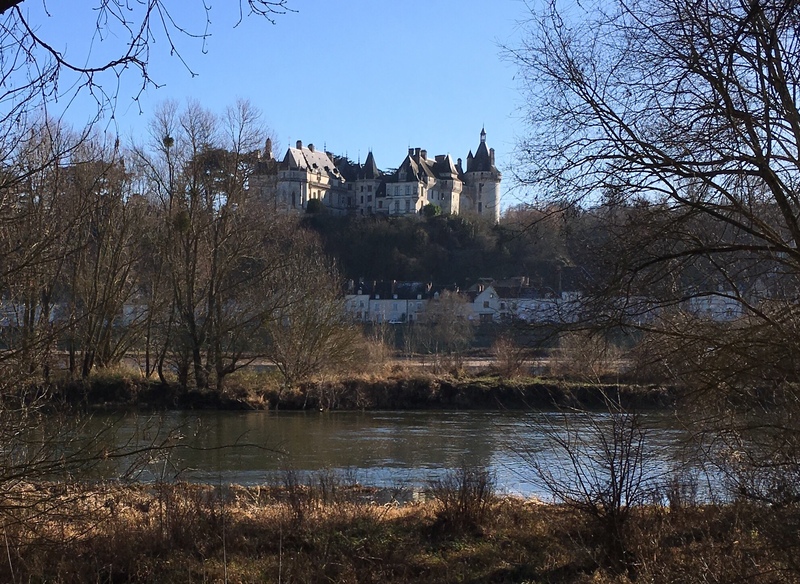 There are some great views of Chaumont from this side of the river, aren’t there? How annoying! I am having orthopedic inner sole problems at the moment. We’ve always walked on the other side but we were looking for some sun yesterday. I’m not that keen on the gardens but I love the chateau. You can park up the hill at the back of the chateau. It’s more convenient.